Abstract: Along to top edge of each stick of the brand-spanking-new Crucial Ballistix Tracer memory are sixteen red & green activity LED's, and an additional eight blue LED's along the bottom of the DIMM. As reviewers, we were extremely pleased to see Crucial enter the enthusiast memory arena with its Ballistix line of DDR memory. After all, the entry of a major player like Crucial should help to drive down prices for the consumer, right? Let's face it, as gamers and case modders, and general geeks, we are drawn to lights. The brighter the colours, and the faster they blink the better too. GeIL were probably the first to place LED's onto a stick of memory, remember the red glowing eyes of the Golden Dragon? 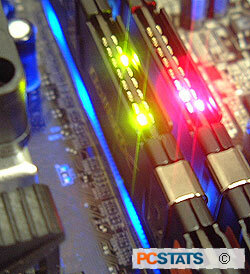 Corsair Memory spiced things up even further with its 'activity LED' enabled PRO-series DDR. With Crucial's Ballistix Tracer series, the cosmetic upgrades have been bumped to the next level. Along to top edge of each stick of the brand-spanking-new Crucial Ballistix Tracer memory are sixteen red & green activity LED's, and an additional eight blue LED's along the bottom of the DIMM. These blue underlights are particularly cool as they illuminate each DDR socket. 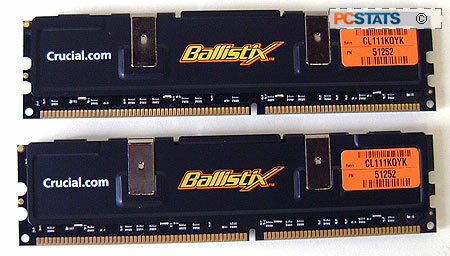 Each 512MB Crucial Ballistix Tracer PC4000 stick is rated to run up to 250 MHz, while maintaining CAS2.5-4-4-8 at 2.8V. The timings are not the tightest, but Crucial is typically a little conservative so we're hoping for some magic. The Ballistix Tracer memory is also certified to run in both single and dual channel operation, for those wondering. At first glance the memory looks pretty much like every other DDR DIMM on the market, but upon closer inspection we can clearly see the LED's on top and near the pins. The ones on the bottom glow a nice blue on both sides, the LEDs on the top alternate red and green in colour. Much like Corsair's PRO DDR memory, Crucial's Ballistix Tracer DDR indicates memory activity through its assortment of red and green LEDs. The busier each stick of Tracer DDR is, the faster the LED's blink and flash. When there's little to no activity, the LED's only cycle slowly. According to Crucial, the brightness of the LED's on the Ballistix Tracer memory will even vary depending on how much voltage is pushed through the memory modules (no more than 3V!). Of course the LED's have absolutely no affect on system performance, and the lights don't draw any more power than with traditional Ballistix memory. PCstats tests DDR memory on two major CPU platforms - the AMD Athlon64 and the Intel Pentium 4 - because RAM behaves differently with each processor architecture. For instance, Intel users tend to run their memory at high speeds with high latency settings, and in general that works quite well for Intel-based computers. It would be detrimental to system performance if you were to run the same DDR memory settings on an AMD Athlon64 system, since latency plays a much larger role in system performance. Because much of our audience is made up of enthusiasts, PCstats also runs overclocking tests so you can get an idea on how far the memory will go. On both Intel and AMD test PCs, we're only interested in seeing how high we can go with the memory running 1:1, as running with other dividers puts the overclocking bottleneck elsewhere, and not with the system memory. On the Pentium 4 test system we sometimes use higher latencies in our tests, as latencies are not as important. With the AMD Athlon64 test system, the DDR RAM latency must run at 2-2-2-5, or the memory's tightest possible timings, as quick access is more important to the CPU design. So, let's get started!